Beating a conference rival twice in a season is never easy, especially when both teams are in contention for a league title and the rematch is on the road. Middleton’s girls’ basketball team faced that challenge when it traveled to Madison Memorial for a pivotal Big Eight Conference battle last Friday night. The Cardinals brought it up one more level — and then some — as they cruised past the Spartans, 63-37. Middleton improved to 11-5 overall, 10-2 in the league and moved into second place in the Big Eight, 1½ games behind first-place Sun Prairie (12-1). Memorial slipped to fourth in the conference at 12-5 and 9-4. Madison La Follette (10-3 league) is third in the conference. The Spartans connected on just 27.1% of their field goals (16-of-59) in the contest, including 11.1% from 3-point range (2-for-18), and had 20 turnovers. The Cardinals used a defensive switch to pull away early in the second half. The switch from a man-to-man defense to a zone defense forced the Spartans into several turnovers and sparked a 9-0 run that gave the Cardinals a commanding 43-23 lead. Tanin started the run with a basket off the glass. Junior Evie Coleman followed with a 3-pointer after an offensive rebound by senior Hannah Flottmeyer and junior Kendall Roquet converted a 3-point play after being fouled on a putback. The Cardinals showed off their hustle during the surge as Flottmeyer scrambled to rebound a miss by Tannin, then quickly found Coleman for an open 3-pointer. 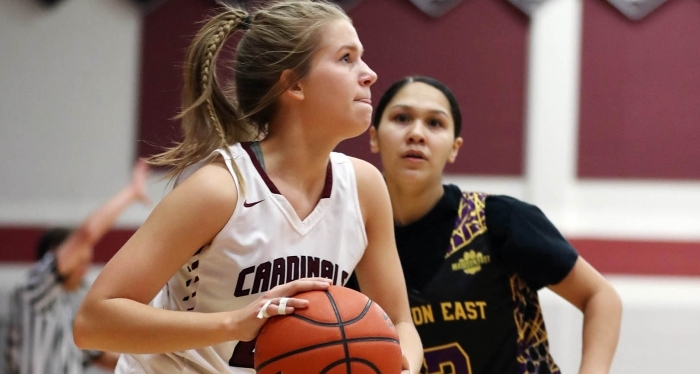 Much like their previous contest vs. Memorial — a 67-46 victory on Dec. 6 — the Cardinals used an inside-outside attack with post-players Tanin, junior Karina Bursac and Flottmeyer controlling the inside and Coleman connecting from outside. Coleman led the Cardinals with 16 points and connected on three 3-pointers. She also had 16 points with four 3-pointers vs. Memorial in the first meeting. Tanin picked up two early fouls and had to sit out much of the first half, but still managed to score 14 points. Tanin picked up her second foul with 15 minutes, 18 seconds remaining in the half and didn’t return until the 6:01 mark. Tanin scored four points and Bursac scored all five of her points in the opening minutes of the game to give Middleton a 9-2 advantage. A 3-point play and layup by Coleman and a free throw by Tannin pushed the lead to 19-8. The Spartans closed within 25-19 on a pair of free throws by Cynthia Rosales and a 3-pointer by Abby Wilson, but Flottmeyer converted a layup to give Middleton a 27-19 lead at halftime. Coleman drilled a 3-pointer to start the second half and the teams traded baskets until Middleton’s decisive 9-0 run which gave them a 20-point cushion with 11:33 remaining. The Spartans couldn’t get closer than 15 points the rest of the way. There was a scary moment late in the game when Middleton junior Josie Lemirande scrambled to control a loose ball and Rosales charged into her at midcourt. The girls appeared to knock heads and crashed to the floor, but both were okay. Lemirande, who was fouled, calmly converted her first foul shot. Memorial continued to miss Leilani Kapinus who was their leading scorer before suffering a season-ending knee injury in November. After notching a third consecutive victory, Lemirande is hoping the Cardinals can keep it going with six conference games remaining including key matchups against Sun Prairie and Madison LaFollette to close the season. MIDDLETON – Charlotte Dunn 0-2 2-2 2, Karina Bursac 2-10 1-2 5, Sitori Tanin 4-10 6-8 14, Hannah Flottmeyer 3-8 1-2 7, Evie Coleman 6-9 1-2 16, Melanie Accola 1-2 0-0 2, Josie Lemirande 2-3 1-3 5, Megan Schwartz 0-0 0-2 0, Kendall Roquet 3-7 1-1 7, Makenzie Hodson 1-2 1-2 3, Brianna Acker 1-1 0-0 2. Totals 23-54 14-24 63. MADISON MEMORIAL – Charlotte Sweet 0-8 0-0 0, Daiysha Brown 1-6 0-1 2, Emmoni Rankins 8-14 0-2 16, Liliana Garcia 1-5 0-0 2, Cynthia Rosales 2-6 2-2 6, Abby Maier 1-2 0-0 2, Maya White Eagle 1-9 0-0 3, Abby Wilson 2-5 1-2 6, Reete Thorns 0-3 0-0 0, Brooke Peters 0-1 0-0 0. Totals 16-59 3-7 37. 3-point goals – M 3 (Coleman 3), MM 2 (White Eagle, Wilson). Total fouls – M 12, MM 23. Fouled out – Rosales.